Hello, friends! It's Day 6 of our 12 Days of Christmas promotion and I just LOVE today's freebie! 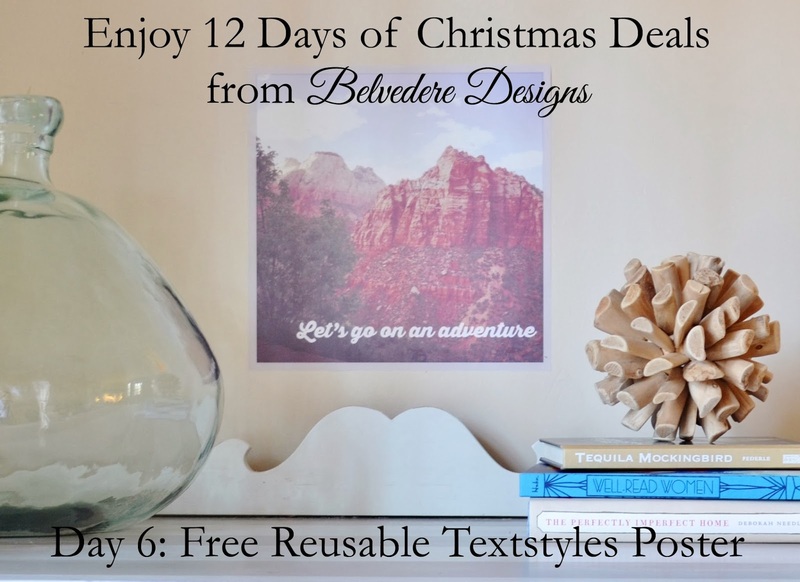 Today only, receive a free Textstyles Poster Print with any purchase! I used mine over a dresser in my dining room, but this would look great in an office, on a gallery wall, or in your entryway. Best of all, it's reusable! You must mention that you'd like this freebie when you order! Just ask for the "Day 6 Textstyles Poster Print" in the comments section of your order. That way, we'll know to include it! And, as always, shipping in the US is free if you spend $50 or more! Lastly, I wanted to mention our holiday order cut-off dates! Orders placed by Tuesday, December 17th (with standard shipping) will arrive in time for Christmas. Orders placed by Thursday December 19th with Expedited Shipping will arrive in time for Christmas. Our shop will be closed the week of Christmas - starting Saturday December 21st. Orders placed anytime during that week will be slightly delayed because of the holiday and will begin shipping the first week of January.